i discovered my first guest via my pal Jessica. she texted me one day saying “do you follow Mad Mim? I think you’d really like her a lot,” and i obediently headed over to check her out. Jess was so right – i fell in love instantly. Miriam has a super cool retro/modern style, she’s the master of hand printing (she’s teaching a class on it at Sewing Summit this year! ), awesome crafts, is an open and honest writer, she’s just a person I liked right away through her blog. 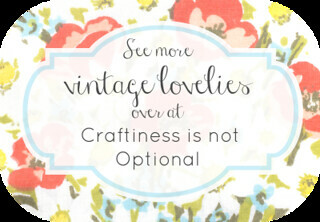 and once you’re through browsing around Mad Mim, be sure to visit craftiness is not optional to see what her first guest cooked up! (hint: it’s Delia, it’s a tutorial, and it’s adorable!). Lesson learned. Obey the Jess. I love Miriam and the dress she made is so perfectly lovely (of course!). Kristin, thanks for having me–I’m so excited to part of your awesome series!! And Delia’s bonnet is so so sweet! !